Miles Global, formerly Linda Miles & Associates, is one of the largest and most respected dental management consulting firms in North America. Founded in 1978 by the legendary Linda Miles, Miles Global has evolved into an Inc 500 company with consultants who speak to professional organizations and dental practices all over the world. With Dr. Rhonda Savage’s acquisition of the company in 2007, the name of the company changed to Miles Global. 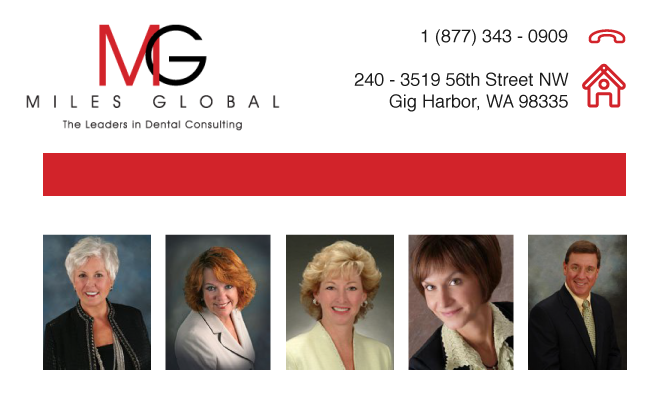 While our home office is located in the small town of Gig Harbor, WA, our reach is global – if there’s an industry conference or seminar, regardless of location, a Miles Global consultant will be there! At Miles Global, we focus on communication. Through decades of experience, we know that excellent communication is the backbone of a successful dental practice. We also emphasize establishing exemplary organized business systems, team accountability, leadership at all levels, customer service, and marketing – all in the pursuit of creating profitable, efficient dental practices. Whether you’re just beginning your dental career or are looking to increase productivity and efficiency in your existing practice, Miles Global’s conferences, seminars, and products will help you and your practice flourish! Rhonda Savage, DDS is an internationally known author and lecturer, and CEO of Miles Global, an international dental training and consulting firm. She lectures and publishes on women’s health issues, leadership, and business management. Her understanding of leadership is deep. A dentist in private practice for over 17 years, she knows the demands of quality patient care, leading a winning team and the running a successful business. Linda Miles, founder of Miles Global, an INC 500 Company, is a true pioneer in the field of practice management consulting. Her career spans four decades in dentistry and 30 of those years as a professional speaker. Consulting has kept her speaking topics fresh and speaking has attracted the top clinicians as clients. Linda recently teamed up with the new owner/CEO of Miles Global, Dr. Rhonda Savage, to take the dental consulting business across the globe and help dental practices worldwide. Many Miles Global dental consulting clients rank in the top percentile of successful practices in North America with the best-trained team members in dentistry.In addition to being a member of the Academy of Dental Management Consultants, Linda is a 26-year member of the National Speakers Association, earning her CSP award in 1983. She also earned her Certified Management Consultant designation of the Institute of Management Consultants in 1993. She is the founder of the Speaking Consulting Network, an annual conference (since 1997) for those wishing to enhance their exposure and business skills as a speaker and consultant. Linda has presented in all 50 states and on four continents to thousands of dentists and team members. She has written three books and produced numerous DVDs, CDs, and videos.In March of 2005, Linda was bestowed the highest honor of her career when she received the Distinguished Service Award at the Hinman Dental Meeting in Atlanta. In 97 years of Hinman, this award has been presented only 24 times. Other recipients include Dr. Peter Dawson, Dr. LD Pankey, and Dr. Gordon Christensen, to name a few. Char Sweeney began her career in dentistry in 1979 as a chair side dental assistant. She attended Ferris State University and the University of Alaska, and received her degree in Allied Health Science Dental Technology. She returned to private practice as a business assistant, and eventually, a practice administrator. She was an independent practice management consultant prior to joining Miles Global in 1992. Char has lectured on numerous dental meetings, including the Greater New York, Masters of Dentistry in Australia, Hinman Dental Meeting, the American Dental Association Meeting and the Seattle Study Club National Symposium. She is a graduate of the Dale Carnegie Institute, a member of the Academy of Practice Management Consultants, the Speaking/Consulting Network, and has been published in numerous journals and newsletters throughout the country. Char’s experience and enthusiasm for dentistry, as well as her love of people, enable her to offer concrete solutions to the daily stumbling blocks all practices encounter. She has worked in both the business and clinical aspect of dentistry, and understands the unique challenges that both areas face. Her goal is to help clients create a sound business plan and assist everyone in reaching their true potential. Susan Kulakowski has more than 30 years of experience in dentistry, which is the foundation of her success as a leading dental management consultant. She has an innate ability to relate to both doctor and staff challenges. Susan has helped many practices achieve their goals through empowering and motivating individual team members to become extraordinary leaders in all aspects of today’s dental practice. Susan is an active member of the Academy of Dental Management Consultants, the Institute of Management Consultants, and the Speaking Consulting Network. She has spoken for the Holiday Dental Conference, the American Dental Association, and Yankee Dental Congress. In addition to speaking, Susan has written articles for prestigious dental publications such as Dental Practice Report, Insurance Solutions, and Trojan Newsletter. A proud dental consultant with Miles Global, Susan is honored to be one of two consultants selected by the US Air Force to serve on the DCO, Dental Clinic Optimization, project in 2003-2004. Dr. Michalski has practiced dentistry in Charlotte for more than 20 years. In that time he has developed a unique approach to “selling” dentistry. His methods are more art than science, more feel than formula. They were born raised and matured in his own practice. The approach is not one derived from a Psychology class or an MBA lecture, it was nurtured through 20 years of banging up against the exact same obstacles you see and hear in your practice every day. Dr. Michalski truly understands the hurdles in front of the dentist/owner because he IS a dentist/owner. Dr. Michalski has been an advocate of technology in Dentistry and an early adopter. Most notably, his office was the first in the country to install 8 operatories of Schick intraoral digital radiography. Quite common today, but when digital radiography was just creeping in to the dental consciousness, this was a huge leap. Since then Dr. Michalski has evaluated several practice management software options, converted his office to “paperless”, implemented the CEREC system, began using digital radiography for panoramic images, and established an interactive website. While most of these approaches are becoming commonplace in the current dental landscape, Dr. Michalski was one of the earliest adopters and remains on the leading edge of technology today, always looking to bring his practice – and yours – into the future. Dr. Michalski was recently selected from thousands of CEREC users in the United States to be one of 8 beta testers for the new CEREC AC Bluecam and has written an article for Dentistry Today regarding the device. Because of his progressive approach, Dr. Michalski has enjoyed a very successful practice which has provided him the time to “spread” the word so to speak. His coaching clients have had unprecedented success since they began implementing what Dr. Michalski teaches. Such success has also allowed Dr. Michalski the time to maintain his golf handicap in the low single digits. Presently it is a 2! Jim Stephens, Products Manager, recently retired from Udelhoven Corporation where he worked in Prudhoe Bay’s Alaskan oil fields. With a degree in electrical engineering, Jim has enjoyed a long and fruitful career and makes a great addition to the Miles Global team.